SOUTHEAST Queensland looks set to be awarded the biggest City Deal in the country, with Prime Minister Scott Morrison revealing support for an ambitious plan to modernise the region. Mr Morrison - who spent hours sitting in traffic during his recent trip to Brisbane - will today answer the call of southeast Queensland mayors, the State Government and The Courier-Mail's Future SEQ campaign to transform one of the fastest-growing regions in the nation. He will be presented with a blueprint to supercharge southeast Queensland's economy while protecting its world-class lifestyle when 10 mayors and the State Government begin negotiations in Canberra as early as tomorrow. The far-reaching goals include transforming the public transport system with a new wave of major projects to speed up services, enabling commuters to get across the same city in 30 minutes and from anywhere in the region to Brisbane within 45 minutes. Economic modelling by consultants KPMG found the plan would deliver a $58 billion boost to the rapidly growing region over the next 25 years. The Transforming SEQ proposal would bring all three levels of government together on an agreed set of infrastructure, economic, development and sustainability priorities and funding models for a quarter of a century. Mr Morrison told The Courier-Mail he wanted the deal to go ahead. It is the second City Deal for Queensland, with a rugby league stadium the anchor project in Townsville. "I am committed to partnering with the State Government and local councils to deliver a City Deal for southeast Queensland,'' Mr Morrison said. "Already we are delivering billions of dollars of funding for congestion-busting roads and rail projects, and this new deal will help unlock further investment to make sure Queensland remains a major tourism destination and one of the world's premier locations to live, work and raise a family. "I want people to get home sooner and have dinner as a family. "I want tradies to spend less time on the road and more time at the worksite." One in seven Australians live in southeast Queensland and several seats held by the Federal Government are marginal, such as Dickson, Petrie, Brisbane and Forde. The announcement today will be a key theme of the coming election campaign, with Mr Morrison to focus on working with other levels of governments to ensure families and workers have the infrastructure of the 21st Century. The State Government and the region's mayors will also pitch their plan to Labor this week, although Opposition infrastructure spokesman Anthony Albanese has already offered initial support. The ambitious plan proposes huge investments to position SEQ as the country's leading smart digital region. The need to lock in such an agreement was the No.1 point in the action plan developed from The Courier-Mail's recent Future SEQ series investigating the challenges and opportunities as the area booms between now and 2043. "SEQ is growing and changing and we know that we have to work together to maintain the great lifestyle that makes this community special," Deputy Premier and Treasurer Jackie Trad said. "We have so much untapped potential, which is why we want to ensure growth makes our region better, not just bigger." The report says southeast Queensland - from the border to Noosa and west to Toowoomba - is growing at twice the OECD average. The current 3.5 million population will swell by 1.9 million over the next 25 years, requiring an extra 800,000 homes and another one million jobs. "We are at a pivotal moment for SEQ, and a City Deal that brings together the three levels of government with the community and industry around a common agenda could be a catalyst to make the region even better," the 60-page document says. "Through a City Deal, we can partner to be more prosperous and more liveable - one region that is connected locally and competing ­globally." 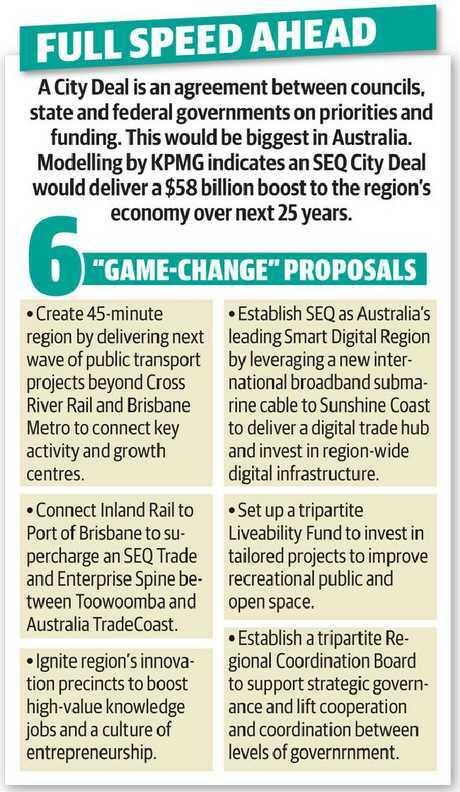 The proposal details 35 "opportunities" including six which it dubs "game ­changers". 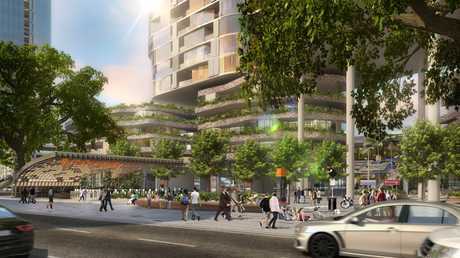 They include building on the multibillion-dollar Cross River Rail and Brisbane Metro projects with a new raft of public transport initiatives. 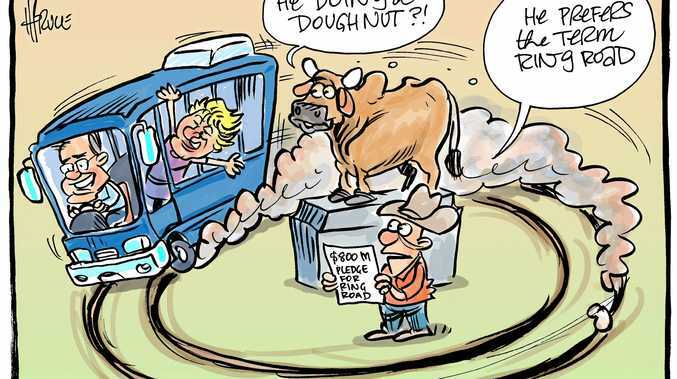 It says connecting Inland Rail to the Port of Brisbane would spark a trade and enterprise spine stretching from Toowoomba to the coast, and unlock new employment in fast-growing areas such as Ipswich and Logan. Growing the network of innovation precincts is a crucial element, and the proposal sets a target of positioning SEQ as Australia's leading digital technology centre. There would be more strategic planning and development of infrastructure and services for high-growth mini-cities springing up across the region. MP for Fairfax Ted O'Brien, who has repeatedly pushed for a City Deal, said it was a unique opportunity "to get ahead of the population curve and plan for investments from both private and public sectors". 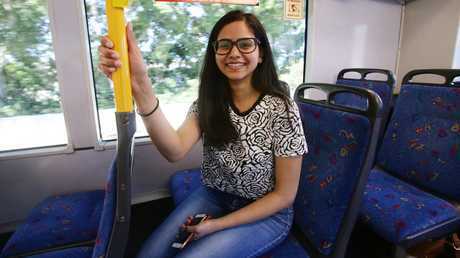 Krisha Rajput, who relies on public transport for her job in Greenslopes, said the area needed faster public transport. "The buses are pretty fast but the trains could definitely run faster," she said.